This post outlines all of the Alaska Lounge locations, including detailed information on exact airport location, hours, and general amenities. Additionally, you’ll find information on how to access these Alaska Lounges including eligibility and day passes. You’ll also learn how to access partner lounges like American Airlines Admirals Clubs, select United Clubs, and more. Hot Tip: Alaska Airlines used to call their lounges “Alaska Airlines Board Rooms.” While some signs and articles may still use the term Board Room, that branding has since fallen away and all lounges are now simply called Alaska Lounges. Special amenity: In-house barista serving Starbucks coffee. Alaska Lounges are some of the best-reviewed domestic lounges out there. 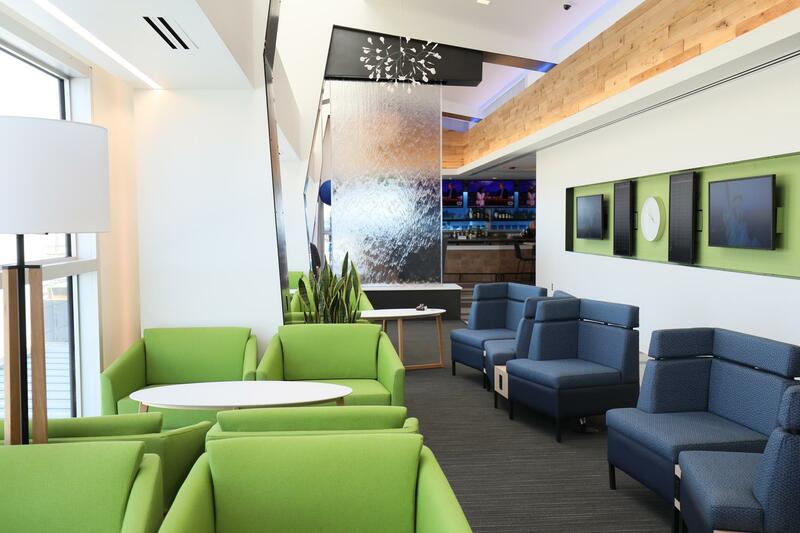 Whether it’s the amenities, genuine hospitality, or room to stretch out and relax, or a combination of all three, Alaska Airlines is recognized for their lounge collection. Food and snacks can be relatively substantial, and the beverage selection is often above average. In some cases, you can get handcrafted Starbucks coffee drinks, such as in the new JFK lounge. The new JFK offers a few made-to-order meals that carry a bit more weight than the standard soups and salads. These are paid meals, but many reviews state they’re worth it; think yogurt parfaits, egg and brioche sandwiches, Margherita flatbreads, and more. While some lounges are larger than others, Alaska generally gives patrons a decent amount of room to stretch out and relax or sit down and get some work done. While all Alaska Lounges aren’t THIS fancy, there’s undoubtedly some hype surrounding the newly opened lounge at JFK! Image courtesy of newsroom.alaskaair.com. 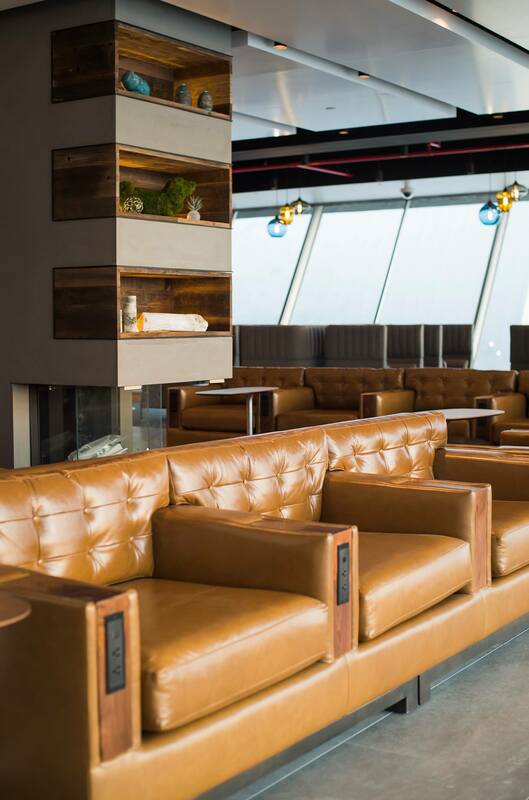 Alaska’s lounges have a Pacific Northwest vibe, making use of rustic wood accents and leather seating options. You can even find a fireplace in the ANC, SEA, and JFK lounges. Every Alaska lounge has a tarmac, terminal, or gate view for planespotting fans. All Alaska Lounges offer complimentary Wi-Fi and workstations, and you’ll find plenty of outlets throughout for charging. If you’re in Anchorage, Los Angeles, Portland, or Seattle, you can reserve a conference room for $25/hr (members) or $50/hr (nonmembers). 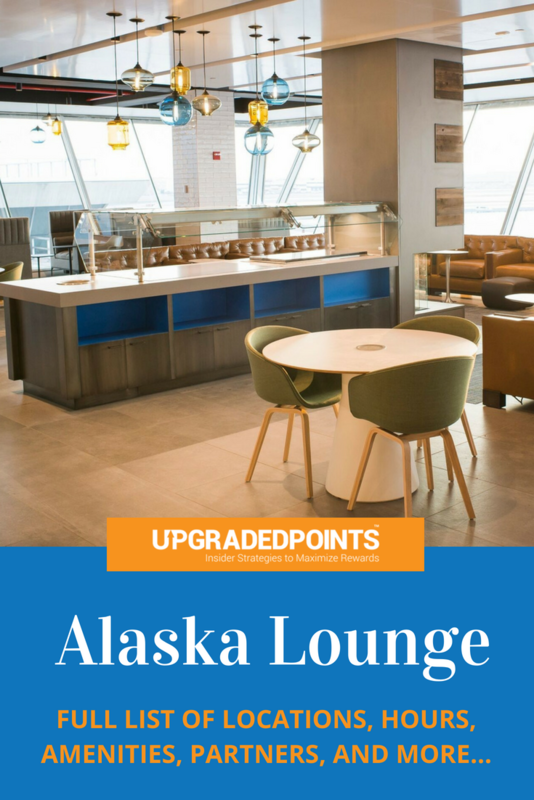 Alaska offers a paid lounge membership that comes with 3 tiered options. You must be an Alaska Airlines Mileage Plan member to purchase a membership. You can purchase a membership online, at any Alaska Lounge location, or by phone. You’ll receive a membership after payment. Members must present this card in addition to their same-day ticketed boarding pass (on any carrier) and a photo ID for access to the lounge. Alaska members can access an Alaska Lounge if they aren’t flying as long as a conference room has been reserved 24 hours in advance, or if the member is attending an Alaska Lounge-sponsored event. Guest policy: Alaska Lounge members can bring immediate family (spouse or domestic partner and children under the age of 21) or 2 guests at no extra charge. Alaska Lounges offer day passes for $50 per person. These can be purchased at any Alaska Lounge location and are valid for a single day only. They must be used in conjunction with same-day, ticketed air travel on any airline. No guests are allowed with a day pass. However, children under 2 years of age can accompany the adult day pass holder at no extra charge. It’s possible (however unlikely) that an Alaska Lounge can limit access or the purchase of a day pass due to capacity restrictions. This is how the purchase of multiple day passes compares to membership fees. For example, if you were thinking about purchasing a standard membership, you would have to make 10 or more visits to an Alaska Lounge in 1 year for the cost of a new membership to outweigh the cost of individual day passes. In some cases, you may be granted complimentary access to an Alaska Lounge. 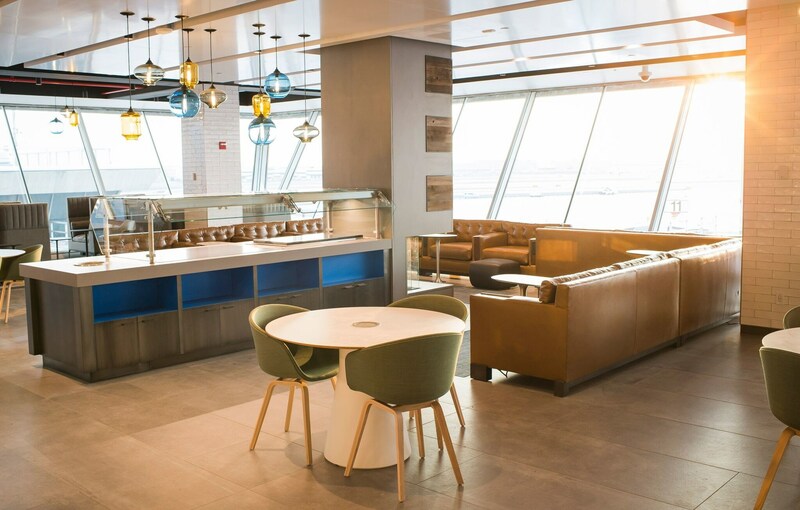 As with some other airline lounges, complimentary lounge access includes any passenger traveling on a paid first class fare or award ticket on a flight operated by Alaska Airlines. Unfortunately, access doesn’t include those passengers who have been upgraded (U class). Passengers must present their same-day first class boarding pass and photo ID. Access is granted on the day of flight only and doesn’t include entrance agreements for other airline clubrooms. Note: Cardholders of the Alaska Airlines Visa Signature® Card do not get access to these lounges. Individuals holding a valid Admirals Club membership are allowed access to all Alaska Lounge locations. Members must present their membership card, a same-day boarding pass for an American Airlines or Alaska Airlines operated flight, and photo ID. This does not apply to One Day Pass holders or Citi® / AAdvantage® Executive cardholders — which is the only credit card that gains you access to Admirals Club lounges. All Alaska Lounges are part of the Priority Pass program. While it’s usually not an issue, it’s important to note Priority Pass members may have limited access to Alaska lounges due to space constraints. Last year saw quite a bit of buzz about Alaska Lounges limiting access to Priority Pass members and their guests. It’s entirely within Alaska’s rights (and any other lounge owner’s rights) to restrict access according to terms and conditions. The main partner for this type of lounge access is American Airlines Admirals Club. Alaska is quick to state that members have access to select locations and these locations may change without advanced notice. Passengers may access an Admirals Club upon arrival or departure on the day of travel on a purchased or redeemed-mileage ticket on Alaska Airlines or American Airlines. As with Alaska Lounge’s guest policy, members are allowed complimentary access for their immediate family or 2 guests, as long as they are also arriving or departing on an Alaska or American flight. Partner lounge access does not include access to any Premium American Airlines lounges and also excludes the Admirals Club in San Francisco. Hot Tip: Just as Alaska Lounge members are allowed access to select Admirals Club locations, Admirals Club members are given access to all Alaska Lounge locations. Alaska Lounge members have access to select Qantas Club locations. The Alaska Lounge guest policy applies, and members and guests do not have access to Qantas’ First Class lounges. There are only 2 U.S. Qantas lounge locations listed as available to Alaska Lounge members: Honolulu Intl (HNL) and Los Angeles Intl (LAX; business lounge). There are 7 additional partner lounges in the U.S. where Alaska Lounge members have access. They are quite a mix, including United Clubs and other partnerships. You can find information about Alaska Lounge house rules here. The rules are pretty standard, so if you’re generally a courteous traveler, you’ll be just fine. Bottom Line: If you fly Alaska Airlines quite a bit, a lounge membership could be worth it, especially if you have status with the airline. However, if you fly a number of different airlines out of a number of different airports and you don’t have status with Alaska, the standard membership is pretty pricey. You’d be better off considering a travel rewards credit card that comes with a Priority Pass membership, especially since you’ll get all kinds of additional travel perks on top of it! Featured image courtesy PRNewsfoto/Alaska Airlines; newsroom.alaskaair.com. Who can access an Alaska Lounge? How much does an Alaska Lounge membership cost? An Alaska Lounge annual membership price varies both by tiered status and whether the membership is new or a renewal. Alternatively, day passes for an Alaska Lounge cost $45 per pass for a single visit. Where can I find an Alaska Lounge? There are 7 Alaska Lounge locations in the U.S. You can find them at the following airports: Anchorage International, JFK International, LAX International, Portland International, and Seattle-Tacoma International (3 lounges). However, Alaska Lounge members have access to over 90 partner lounges worldwide. In the U.S., partner lounges are primarily made up of American Airlines Admirals Club locations which are scattered around the states. How To Fly Singapore Suites For Just 4,000 Additional KrisFlyer Miles!